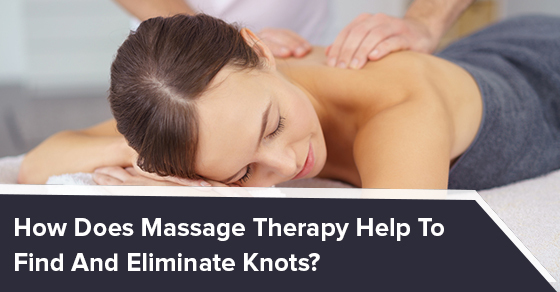 How Does Massage Therapy Help To Find And Eliminate Knots? | Dynamic Physiotherapy & Sports Injury Clinic Inc.
How Does Massage Therapy Help To Find And Eliminate Knots? It starts with a pain in your neck, shoulder or back. At first you try to work through it, but after a few days the pain persists. The more you stress about the pain, the worse it seems to get. What is causing this pain and how can you stop it? Most likely, you have a knot, which massage therapists are trained to find and get rid of. Knots are what happens when a muscle becomes overworked, causing it to spasm and to form a tight ball. A knot can be made up one muscle’s fibres, or two or more muscles that share an attachment to the same bone. Our muscles work by being activated when we use them, and deactivated when we don’t. However, when a muscle continues to be activated when we’re done with the exertion, it will twitch, forming a knot. When a muscle spasms, individual sections within it constrict and pull from both sides, leaving you with pain. The most common cause of knots is overworked muscles. Knots can also be caused by accidents when a certain area is traumatized. You can also get knots from injuries or from performing too much physical activity. Finally, we get knots because, as human beings, we’re stressed. When our neck and shoulders constrict with the weight of the world, knots form. If we didn’t get stressed, massage therapists would be out of business, but as it is we need massage therapists to cure us of our knots. How are massage therapists trained to eliminate knots? Massage therapists are trained to feel where knots occur by looking for tension in the back, neck and shoulders. They find this tension and release it by applying deep compression with their thumb, fingers or elbow, and holding for 20-30 seconds. This technique is called sustained compression and is repeated several times until the knot and the pain it’s causing dissipates. Sustained compression can cause a bit of pain itself because of the pressure applied to the area, but massage therapists are also trained to help you focus on your breathing while they are performing this knot elimination technique. Furthermore, during your massage session, you will be in a quiet room with soft lighting and calming music to ensure that you are deeply relaxed. Why should you get a massage to treat knots? If you have knots do not try and treat them on your own. Massage therapists are trained to eliminate knots, whereas you could injure yourself further if you try to do it yourself.